With sincerity and hard work of our professionals, we have carved a niche for ourselves in this domain by providing a premium quality gamut of Clevenger Apparatus. SpecificationsEssential Oil determination (clevenger type) vertical tube combined with condenser. Essential Oil determination (clevenger type) vertical tube combined with condenser and measuring tube with stopcock A return tube for the aqeous part of the distillate connects the bottom of the measuring tube and the vertical tube. Reckoned as one of the emergent companies of the industry, we are extremely immersed in providing Clevenger Apparatus. Backed by years of industry experience, we are engaged in offering a premium quality range of Clevenger Apparatus. We are ranked amongst the most trusted firms deeply engaged in offering a wide range of Clevenger Apparatus. We have different sizes i.e. 10ml to 20, 000ml whose price range from Rs.1650 to Rs.14400 available with us. 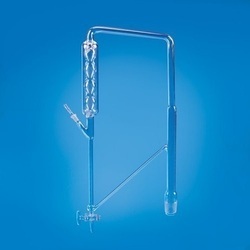 We are engaged in offering wide range of Clevenger Apparatus for determination of volatile oil lighter than water comprising of 1000 ml flask, oil separatory tube and condenser. These apparatus are manufactured using high grade glass procured from reliable sources. Moreover these products are available in different shape, sizes and can be customized as per client requirement.